Is your Mac running painfully slow? Is it hot to the touch? Sounds like a jet engine? Or are you generally curious about what goes on inside? Well, you can get a sneak peek at all your Mac’s activity by accessing the Activity Monitor – Mac’s equivalent to the task manager. 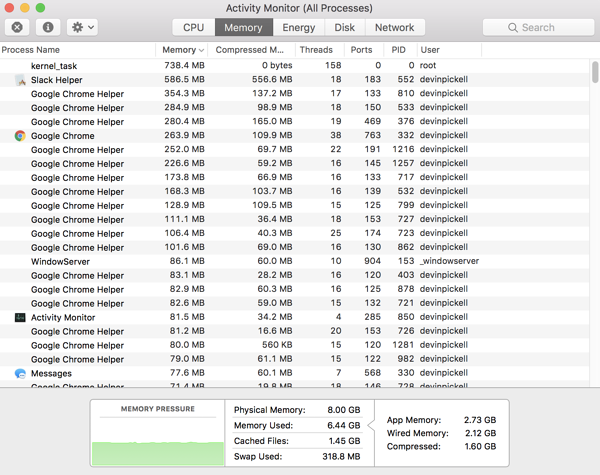 Task manager may have originated on Windows computers, but Mac users adopted the term and used it interchangeably for Mac’s Activity Monitor. 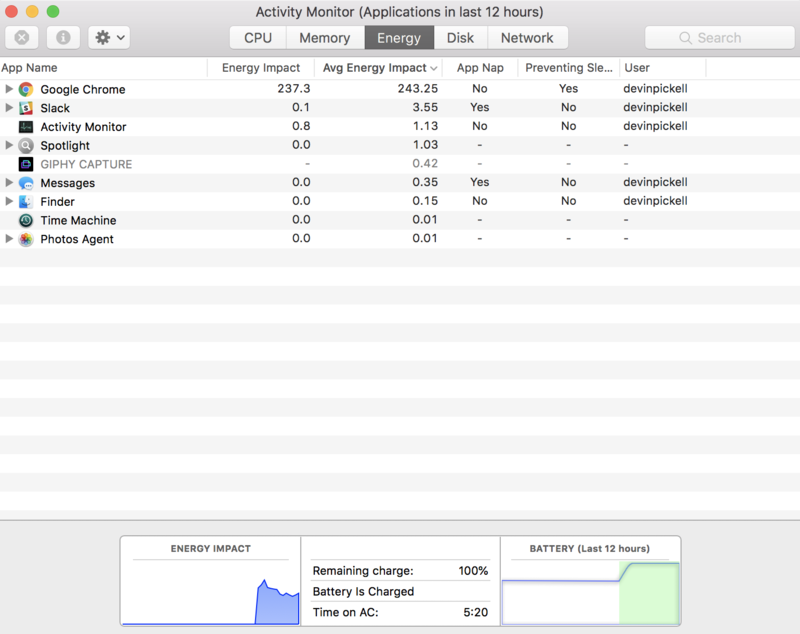 Any active process or task taking place on your Mac will be shown in the Activity Monitor. 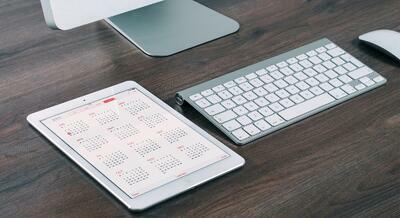 Users can view, manage, and end activity in a simple dashboard. For example, if Slack is eating up lots of processing power and slowing down your Mac, you can force quit the application to free up some space. To access Activity Monitor, you’ll first need to find it. Access the Spotlight Menu by clicking the magnifying glass at the very top right of your display or by entering the keyboard shortcut Command + Space. Type in “Activity Monitor” in the search bar and click Return. CPU – Stands for “central processing unit.” Essentially, CPU is how much processing power is dedicated to each task. Memory – Shows how much of your Mac’s RAM, or random-access memory, is dedicated to each task and application. RAM helps your Mac complete tasks and find information quicker. Energy – Monitors how much energy each application opened in the past 12 hours has consumed. Higher energy output means more stress on your Mac’s battery. Disk – Each task and application reads and writes a different amount of data on your Mac’s disk. This tab monitors that activity. Network – This is how much data is being sent and received from applications connected to the internet. I understand a lot of tech lingo was just thrown at you, so let’s dive into each of the five tabs to clear things up. The CPU is considered the “brains” of the computer, and it’s where most of your Mac’s calculations, logic, and decision making will take place. 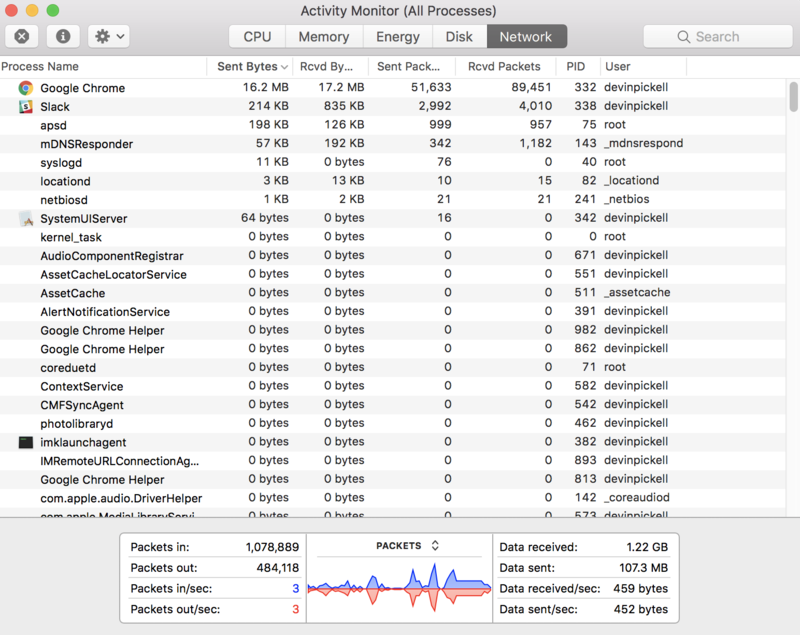 Some of the more important columns to look out for in this tab include % CPU, CPU Time, and Threads. Below is a breakdown of each of these columns. % CPU – This number shows the percentage of CPU dedicated to each task. A high % CPU indicates a task may slow down your Mac, increase temperature and fan activity, affect battery performance, and more. CPU Time – This number shows how much time the CPU has been dedicated to each task. 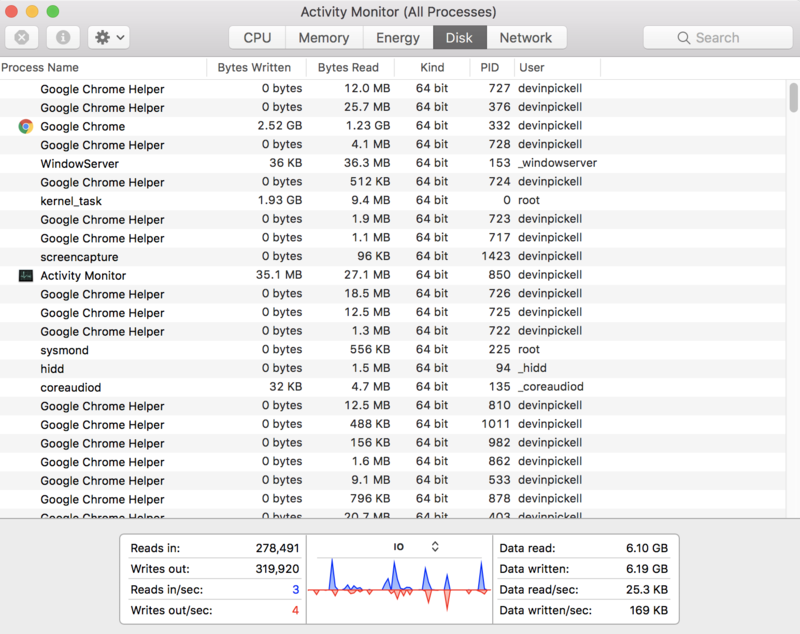 You can see from the picture above that my Mac spends a lot of time processing information from Google Chrome. Threads – This number shows how many threads are dedicated to each task. What is a thread, you may ask? A thread is a sequence of instructions your Mac requires to complete a task. More threads may indicate a larger task. At the bottom of the CPU tab, you’ll notice a chart with red and blue activities being monitored. 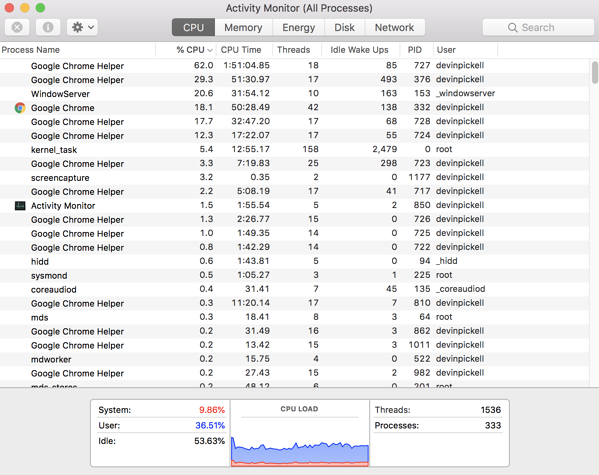 This chart breaks down the total CPU usage, or load, on your Mac. Red indicates how much CPU your system is using. It’s common to see anywhere from 5-15 percent of CPU dedicated to the system to keep your Mac up and running. Blue indicates how much CPU the user is using. 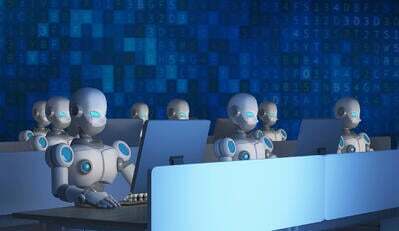 Anywhere from 30-50 percent is common, depending on how many applications the user has open at once. Any CPU not being used is referred to as idle CPU. This number is always fluctuating. If CPU is considered the “brain” of the computer, then its memory, or RAM, is considered its neural connections. Some of the more important columns to look out for in this tab include Memory and Compressed Memory. Below is a breakdown of both of these columns. Memory – This number shows how much RAM each task and application is swallowing up. Large amounts of memory – typically in the hundreds of megabytes – may affect your Mac’s performance. Compressed Memory – This number shows how much compression has been applied to a task’s memory usage. The less compression, the better. At the bottom of the memory tab, you’ll notice a chart with mostly green activity being monitored. This chart breaks down how much compression, or memory pressure, is being applied on your Mac. As mentioned before, no compression is ideal. However, sometimes an application demands the use of more memory. This is where compression kicks in. In this case, you may see the chart turn from green to yellow, and sometimes even red. Yellow indicates slight compression is occurring, whereas red indicates max compression. Staying out of the red is optimal for your Mac’s performance. The energy tab reveals how much total energy is being used by your Mac. This is calculated over a 12 hour period and factors in everything from CPU to RAM. Some of the more important columns to look out for in this tab include Energy Impact, App Nap, and Preventing Sleep. Below is a breakdown of each of these columns. Energy Impact – This number shows how much energy is currently being used by each application. The lower energy impact, the better on your battery life. App Nap – Applications on your Mac that support App Nap consume little energy when they’re not being used. For example, an app you have minimized will consume less energy with App Nap. Preventing Sleep – Applications that prevent sleep will keep the Mac display on until the user exits out of them. At the bottom of the energy tab, you’ll notice charts with blue and green activity being monitored. These charts visualize energy impact and battery strength over the past 12 hours. Every process on your Mac both reads data from the disk drive and writes data on the disk drive. It is essentially a storage and organization mechanism. Some of the more important columns to look out for in this tab include Bytes Written and Bytes Read. Below is a breakdown of both of these columns. Bytes Written – This number shows how many bytes from this process have been written onto the disk drive. Bytes Read – This number shows how many bytes from this process have been read from the disk drive. At the bottom of the disk tab, you’ll notice a chart with red and blue activity being monitored. This chart visualizes the data being read and written. 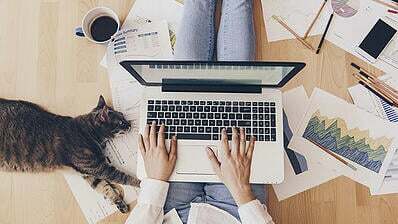 Applications which utilize an internet connection will both send and receive bytes, as well as packets of data. Some of the more important columns to look out for in this tab include Sent Bytes and Received Bytes. Below is a breakdown of both of these columns. Sent Bytes – This number shows how many bytes from this process have been sent to a network. Received Bytes – This number shows how many bytes from this process have been received from a network. At the bottom of the network tab, you’ll notice a chart with red and blue activity being monitored. This chart visualizes the packets of data being sent and received from a network. A packet is essentially how information is transmitted over the Web. Now that you have a basic understanding of the Activity Monitor and its important functions, let’s move on to some of the most frequently asked questions regarding the Mac task manager. How do I force quit a task? If you’re already in the Activity Monitor, you might as well quit or force quit a task here. If you’re not in the Activity Monitor, there is a keyboard shortcut for force quitting. This shortcut is Command + Option + Esc. Which tasks are safe to quit? Mostly tasks that can be seen in the energy tab. Abruptly ending tasks without knowing what you’re doing can cause serious problems to your Mac, so if your performance is suffering, it’s best to see a professional. Why is kernel task using so much memory? You may notice a process name of “kernel task” at or near the top of your memory. Worry not, as you’ll see its compressed memory is extremely low – if not at 0 bytes. One of the main purposes of the kernel task is to monitor the temperature of your CPU. 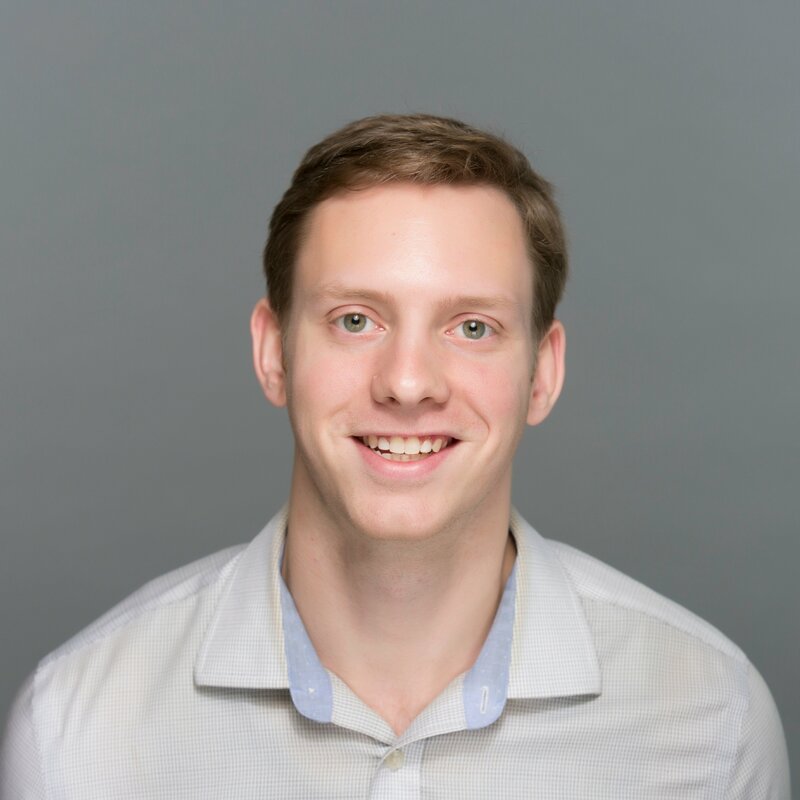 Who is the root user? You may notice a variety of users, mostly yourself, next to each process name. But one user, in particular, shows up a lot as well. This is the root user. Do not force quit tasks under the root user. This is considered the “superuser” with read and write privileges to different areas of the system – important to your Mac’s performance. That’s it! You’re now aware of what’s going on behind the scenes with your Mac. Next time it’s acting up, check out the Activity Monitor to locate the root of the problem. Many of the instructions provided in this article were done through Mac’s screenshot feature. To take high-quality screenshots of your own, check out our guide on the five easiest ways to take screenshots on Mac.